Carrot On A Stick is used to control the direction of a Pig with a Saddle attached. The pig will run in the direciton the stick is facing. You can right click while holding the stick to make the pig run quicker. 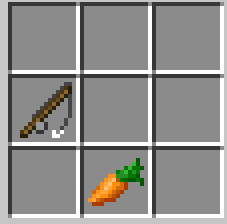 If the fishing pole does not have full durability because of the use in fishing then you can not use it to make the carrot on a stick item. Durability on the stick is reduced if you do not reel in a fish.